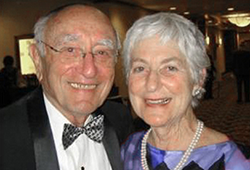 In June 2012 Portland's Jewish community lost one of its most beloved and admired mensches, Henry Blauer z"l. There is hardly an organization in Jewish Portland that was not touched by Henry, including OJCF, which he helped found. After his death, Henry's family and his partners at Geffen Mesher established the Henry S. Blauer Memorial Fund in his honor. The fund supports OJCF's LIFE & LEGACY initiative, which serves the community-wide mission of developing Jewish legacy gifts and other similar community-building activities. "Henry was a transplant to Portland from Poland via New York," said Henry's wife, Gerel. "He felt embraced by our community's spirit of warmth and openness and discovered opportunities here to make a wonderful life. As a result, he wanted to give back, to create a legacy for the place that helped shape his life. I hope the fund will inspire and educate others to become good stewards of this place we all call 'home.'" "This was simply the very best way to honor Henry for his immense contribution and commitment to the long-term well-being of our community," added Geffen Mesher partner and friend, Stan Geffen. Friends, family and colleagues of Henry's are invited to contribute to the fund in honor of his memory. While Henry's loss will forever be felt, the fund that bears his name will endure as a tribute to the spirit of his generosity.